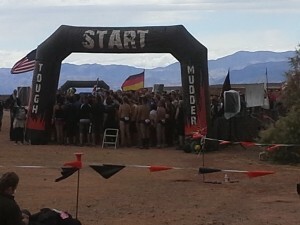 Over the weekend, my company’s awesome Las Vegas Tough Mudders headed out to tackle this epic obstacle course for “Team F Cancer.” I am in no shape to run 10 miles and throw myself through 20 obstacles. It’s not that I can’t get there, but I just wasn’t up for it this year. However, I did find a way to support our team and the whole Tough Mudder event. 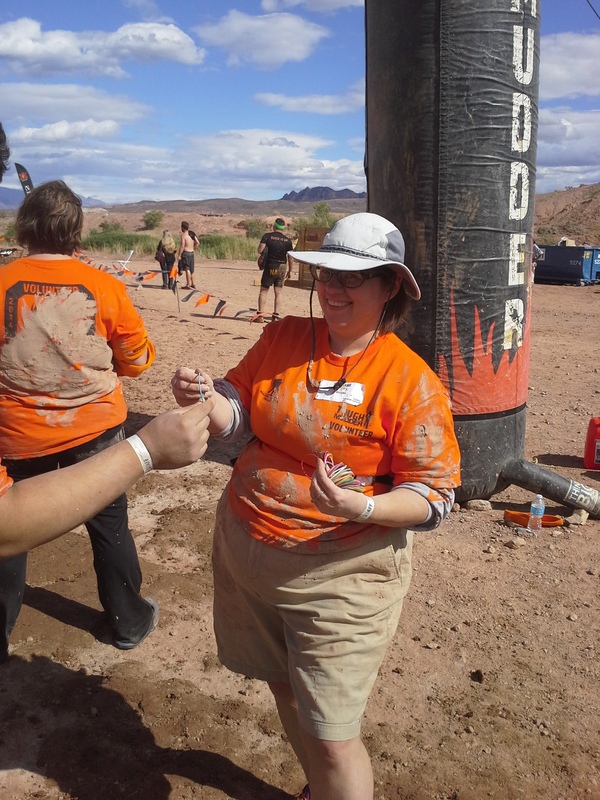 I signed up in January, as soon as the Tough Mudder “MVP” (Mudder Volunteer Program) was open, and volunteered for a Saturday afternoon shift at the finish line. We didn’t know the F Cancer’s start time until the week before the event, but I figured I had a better than 50-50 chance of seeing them at the finish and cheering them in (I lost that bet, by the way, but other volunteers remembered my guys and told me they were all completely awesome…. I completely agree). F Cancer’s heat was at 8 in the morning, one of the first heats of the event, probably because our CEO, Ron, is a return Mudder– making him part of the Mudder Legion of participants who have done more than one Tough Mudder. They were done by the time I finally took over handing out finisher wristbands at the Finish Line. These were used to get your Finisher T-shirts– no wristband, no T-shirt… in theory. In practice, a lot of people coming out of the mud and electroshock pit are bleeding, shaking, shocky, and can barely process a half-sentence. 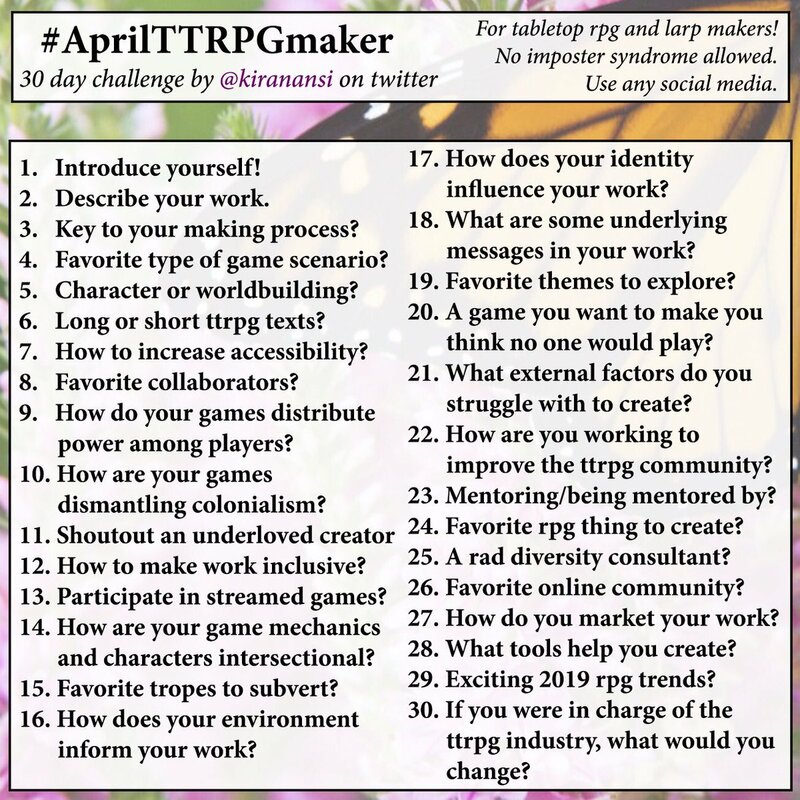 I’m handing them little jelly bracelets that they need to hold onto while they splash water into their mouths to clear out the mud they ate while being electrocuted. And that’s assuming they’re not bleeding from a big gash in the hand from the giant rock in the Electroshock pit. There were so many of these types of injuries, the on-course medic moved his station back towards the finish line to triage and recommended people rinse off and drive themselves to Urgent Care if they still felt they needed medical attention. Mudderers will be happy to know the course staff did get the rock out, at about 3 PM, with another 50 participants still on the course. At least that injury should be less prevalent for the Sunday Mudders. Also around that time, the other 2 wristband volunteers had to leave their shift early and handed off their wristbands to somewhat less-dedicated volunteers. I stuck to it, though, and leveraged the Mudder spirit. As I handed out wristbands to teams, I said “Make sure everyone on your team gets one, okay?” This helped share the responsibility for getting their shirts. I also made sure if one of the team members was being led off for medical attention (that darned rock!) that someone on their team had a wristband for each teammate. After all that, seeing so many people hurt, shaking, exhausted, and bleeding, I am sure you might wonder: Will I do Tough Mudder next year? If I have a team like Rocket’s F Cancer to run with, there’s really only one possible answer: HELL YES! !